On Friday, the always inspiring Holly from Bijou Lovely, asked for pattern testers for her Colorblock Quilt pattern. I, of course, voluteered. She emailed me yesterday, when I was in the doctor's office with a sick Derek [bronchitis!]. So between yesterday evening and today I have whipped up this adorably quick quilt. I have had some fat quarters of Valori Well's Nest line for over a year with no intended project and some Joann's fabric I purchased before I found the addicting world of designer fabrics. 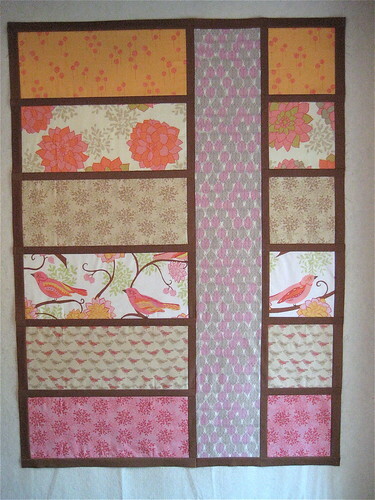 In all of Holly's pictures, she sashed the quilt with white solid and so I decided to go a different way with Kona Earth. This quilt is more neutral than anything I've done lately...or ever. This quilt finishes at 40 x 55". Holly's pattern made this quilt really quick to put together and I rather like the offset column. Her pattern should be coming out pretty soon and I'd recommend it for a fast baby quilt. I'm going to quilt this one and finish up the etsy quilt and have more pictures at the end of the week. Popping over from Bijou Lovely to say that I *love* your colorblock quilt! The brown sashing is gorgeous!